I've written before that I'm aware that narrative films aren't documentaries and I don't turn to them for definitive information. Still, that doesn't change the fact that when a movie focuses on a very specific topic, we can't help but wonder how much of it is taken from reality. I think that this is especially true when a film zeroes in a given profession. If it's a job that is distinct or unusual (and I'm talking about a real job, not something like Ghostbuster), I won't necessarily take what I'm seeing as gospel, but I will assume that someone has done some research and based the story on something from the real world. Having said that, let's hope that much of what we see in Kill Your Friends is made up...but something tells me that it's not. Taking place in London, 1997, Kill Your Friends introduces us to record company A&R man Steven Stelfox (Nicholas Hoult). Steven likes drugs, drinking, traveling, and making money, but he doesn't seem to really care about music. His job is to find new acts for his record label, and as long as the artist is successful and makes money, the music is not his concern. (Although, he makes it clear that he doesn't like bands.) With his scout, Darren (Craig Roberts), at his side, Steven visits clubs and parties, making connections and looking for the next big thing. The industry is very competitive and signing a big artist can make someone like him a legend. Steven's ambition knows no bounds and in his pursuit of an executive position, nothing is beneath him, not even murder. Kill Your Friends is based on a novel by John Niven, who also wrote the screenplay. The story is narrated by Steven and, having not read the book, I can only assume that much of this dialogue is taken directly from the novel. This gives the film a feel which is very similar to Trainspotting and American Psycho. And comparisons to those films would be very apt with Kill Your Friends' content as well. The fact that the movie is steeped in British slang and the way in which Steven and his colleagues inhale drugs is certain akin to Trainspotting. Steven's obsession with his position, but not his job, and the way in which he will go to any lengths to get ahead will definitely remind some viewers of Patrick Bateman. But, it's Kill Your Friends focus on the record industry which makes the film unique. Sure, we’ve seen movies about musicians and recording contracts and the like, but we get a different approach here. For starters, I'm sure that even those who have heard the term A&R aren't aware of what those letters stand for -- Artists & Repertoire -- or what the job entails. Steven describes, in very cynical detail, how it is his job to find new acts to bring to the label. This entails visiting nightclubs, traveling to music festivals around the world, and, sometimes, but not often, relying on the opinions of others. We see the pressure involved with the job as the label must invest in new acts in order to attract them, but there’s no guarantee that the investment will pay off. And there’s a lot of turnover in the profession. Let’s all hope that while the basic job description presented here is accurate, many of the other details are embellished. I certainly don’t doubt that there are drugs, backstabbing and betrayal in the music industry, but Kill Your Friends paints a picture where these things overrule any interest in music. While Kill Your Friends is definitely bleak at times and may be overly reminiscent of other movies, it’s still very interesting. This is one of those movies where the viewer isn’t sure if we should be rooting for the main character or not. Steven is our guide through this strange world and he’s certainly charming, but he also deserved to be punished for the awful acts he performs. The characters are nicely defined and there are some funny moments here as well. (Darren’s reaction to a vulgar song is priceless.) Fans of 90s British music will love the soundtrack. I can say that the movie is about 13-minutes too long and the extension of the finale destroys the overall nice pacing. In the end, Kill Your Friends is one of those movies which is certainly worth a look and makes on wonder why it didn’t get more attention. 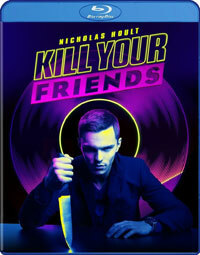 Kill Your Friends could use a meeting with HR on Blu-ray Disc courtesy of Well Go USA. The film has been letterboxed at 2.35:1 and the Disc contains an AVC 1080p HD transfer which runs at an average of 20 Mbps. The image is very sharp and clear, showing no overt grain and no defects from the source materials. The colors look very good and the image is never overly dark or bright. The image offers a nice level of detail and the depth works well. The Disc carries a DTS-HD Master Audio 5.1 track which runs at 48 kHz and an average of 2.5 Mbps. The track provides clear dialogue and sound effects. As one would expect, the movie is filled with music and it sounds very good, offering clear speaker separation and distinct bass. The stereo and surround sound effects also shine during the club scenes. The main extra feature on the Kill Your Friends Blu-ray Disc is a series of interviews with key personnel -- Nicholas Hoult (5 minutes), James Corden (3 minutes), Craig Roberts (2 minutes), Director Owen Harris (7 minutes), and Writer John Niven (9 minutes) -- who are asked pretty standard questions about the characters and the story. The only other extra is a TRAILER for the film.